Timothy Niedermann reviewed H. Nigel Thomas’ No Safeguards in a recent article for The Ottawa Review of Books. Niedermann begins by explaining that Thomas’ novel tells the story of two brothers, Paul and Jay, who have immigrated to Montreal. Although Paul and Jay are gay, Niedermann states that rather than focusing on their homosexuality, “’No Safeguards’ is about how these two brothers grow up, separately and together – who and what nurtures them, injures them, makes them what they now are”. Niedermann states that Thomas tells the story of these two brothers with skillful characterization: “’No Safeguards’ is filled with wonderful scenes of island life, made alive by the use of colourful dialect and vivid characters – Grama, in particular, is a force of nature. A tangible sense of pathos is present in several other characters as well. Anna comes across as tragic yet human in her losing struggle against what life has thrown at her. And above all there is poignancy in the frustration and confusion of both boys as they grow up while trying to sort out their troubled and conflicted relationship with their parents and grandmother”. By referring to Thomas’ own background, as a gay immigrant from St. Vincent, Niedermann considers how No Safeguards is shaped by Thomas’ own experiences. Niedermann states that the novel “has re-created the disjunction of every immigrant, especially the children, who must exchange the set of norms and expectations they developed in their homeland for another that is neither familiar nor explained”. Niedermann concludes his review by returning to “the poignancy of [the brothers’] lives”, stating that by the end of the novel, “one comes away with an appreciation of the strength of these two boys, now men, who have experienced so much yet retained a commitment to each other that cannot be broken”. 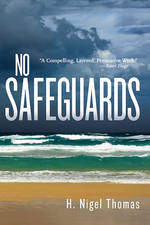 Tagged with H. Nigel Thomas, No Safeguards, Ottawa Review of Books, Timothy Niedermann.